From 1947, both Tibet and India anticipated Trouble in Tibet while the Communists came into Power in China forcing Chiang Kai-shek’s Nationalists to retreat to Formosa or Taiwan.During 1945 to 1949, Tibet was unwilling to accept US Friendship hoping Red China will respect Tibet’s Policy of Isolationism. Trouble in Tibet speaks of lack of Intelligence capabilities; Tibet’s Trouble describes Tibet’s Intelligence failure; Tibet failed to know Enemy’s Mind and it is total Intelligence Disaster. For Tibet failed to provide necessary Intelligence, the response of India and the United States was inadequate from the beginning of Tibet’s Trouble. 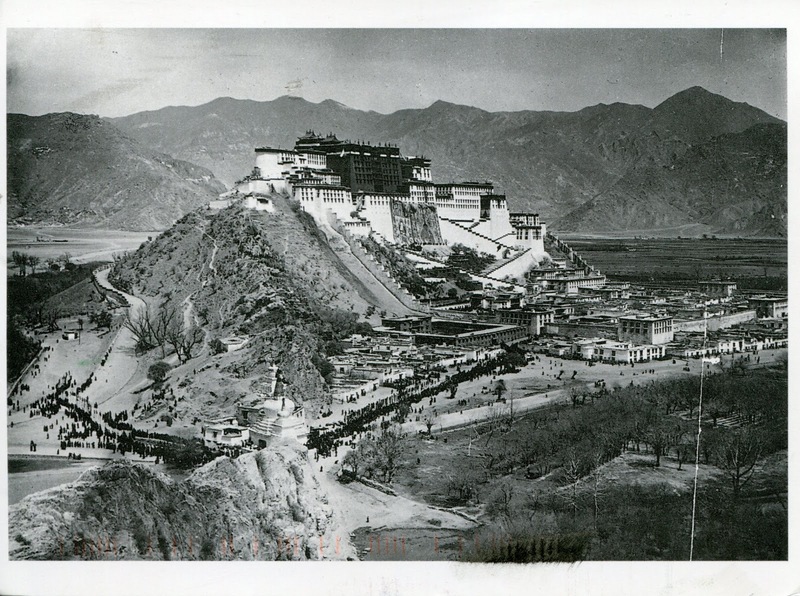 On March 10, 1959, several thousand Tibetans, fearing that the Chinese might abduct the Dalai Lama, gathered at the Norbulingka summer palace to protect the Tibetan spiritual leader. Credit The Office of Tibet, Washington, D.C. Generations of Chinese have been taught that the Tibetan people are grateful to China for having liberated them from feudalism and serfdom, and yet Tibetan protests, including self-immolations, continue to erupt against Chinese rule. 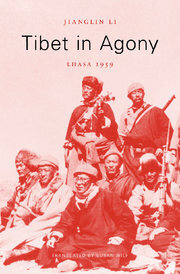 In ‘TIBET IN AGONY: LHASA 1959’,to be published in October by Harvard University Press, the Chinese-born writer Jianglin Li explores the roots of Tibetan unrest in China’s occupation of Tibet in the 1950s, culminating in March 1959 with the Peoples Liberation Army’s shelling of Lhasa and the Dalai Lama’s flight to India. In an interview, she shared her findings. You’ve drawn parallels between the killings in Lhasa in 1959 and the 1989 military crackdown on pro-democracy protests in Beijing. China was better able to cover up its actions in Lhasa in 1959, before the advent of instantaneous global media coverage, but the two have much in common. In both, the Chinese Communists used military might to crush popular uprisings, and both involved egregious massacres of civilians. But for Tibetans, what sets the Lhasa massacre apart is their bitter sense of China as a foreign occupying power. 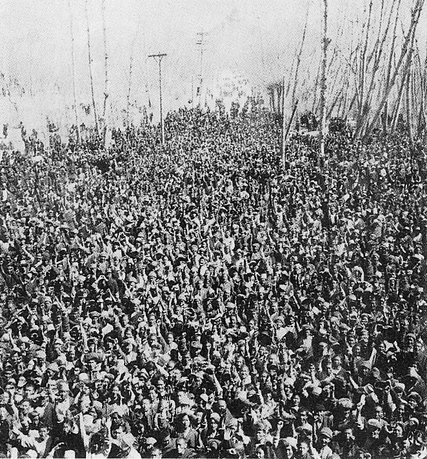 The Tibetans were subjugated by force, and they are still protesting today. The crisis began on the morning of March 10, when thousands of Tibetans rallied around the Dalai Lama’s Norbulingka palace to prevent him from leaving. He had accepted an invitation to a theatrical performance at the People’s Liberation Army headquarters, but rumors that the Chinese were planning to abduct him set off general panic. Even after he canceled his excursion to mollify the demonstrators, they refused to leave and insisted on staying to guard his palace. 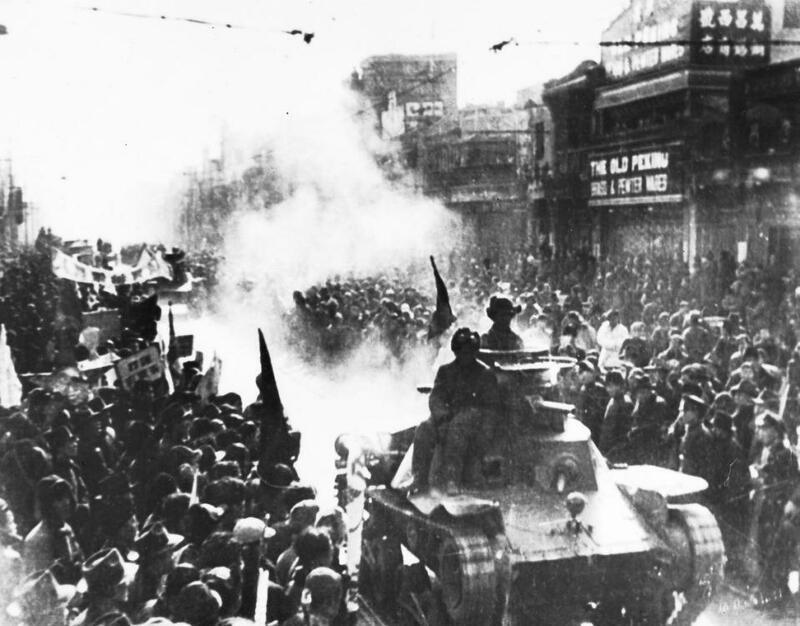 The demonstrations included a strong outcry against Chinese rule, and China promptly labeled them an armed insurrection, warranting military action. About a week after the turmoil began, the Dalai Lama secretly escaped, and on March 20, Chinese troops began a concerted assault on Lhasa. After taking over the city in a matter of days, inflicting heavy casualties and damaging heritage sites, they moved quickly to consolidate control over all Tibet. Why did the Dalai Lama flee to India? Mainly he hoped to prevent a massacre. He thought the crowds around his palace would disperse once he left, robbing the Chinese of a pretext to attack. In fact, not even his departure could have prevented the blood bath that ensued, because Mao Zedong had already mobilized his troops for a final showdown in Tibet. When the Dalai Lama left, he didn’t plan to go as far as India. He hoped to return to Lhasa after negotiating peace with the Chinese from the safety of the Tibetan hinterlands. But once he heard about the destruction in Lhasa several days into his journey he realized that plan was no longer feasible. Why were the Tibetans afraid the Chinese would abduct the Dalai Lama? For Tibetans, he is a sacred being, to be protected at all costs. He had traveled to Beijing to meet Mao in 1954 without setting off mass protests. By 1959, however, tensions had risen, and Tibetans had reason to fear the Chinese theater invitation might be a trap. The trouble actually started in the Tibetan regions of nearby Chinese provinces Yunnan, Sichuan, Qinghai and Gansu, home to about 60 percent of the Tibetan population. When the Chinese Communists forced collectivization on these Tibetan nomads and farmers in the latter half of the 1950s, the results were catastrophic. Riots and rebellions spread like wildfire. The Communists responded with military force, and there were terrible massacres. Refugees streamed into Tibet, bringing their horror stories into Lhasa. Some of the most frightening reports had to do with the disappearances of Tibetan leaders in Sichuan and Qinghai. It was party policy to try to pre-empt Tibetan rebellion by luring prominent Tibetans from their communities with invitations to banquets, shows or study classes from which many never returned. People in Lhasa thought the Dalai Lama could be next. You’ve documented the massacres of Tibetans in the Chinese provinces in the late 1950s. In 2012, I drove across Qinghai to a remote place an elderly Tibetan refugee in India had told me about: a ravine where a flood one year brought down a torrent of skeletons, clogging the Yellow River. From his description, I identified the location as Drongthil Gully, in the mountains of Tsolho Tibetan Autonomous Prefecture. I had read in Chinese sources about major campaigns against Tibetans in that area in 1958 and 1959. About 10,000 Tibetans, entire families with their livestock had fled to the hills there to escape the Chinese. At Drongthil Gully, the Chinese deployed six ground regiments, including infantry, cavalry and artillery, and something the Tibetans had never heard of: aircraft with 100-kilogram bombs. The few Tibetans who were armed, the head of a nomad household normally carried a gun to protect his herds shot back, but they were no match for the Chinese, who recorded that more than 8,000 rebel bandits were annihilated, killed, wounded or captured in these campaigns. I wondered about the skeletons until I saw the place for myself, and then it seemed entirely plausible. The river at the bottom of the ravine there flows into a relatively narrow section of the Yellow River. In desolate areas like this, Chinese troops were known to withdraw after a victory, leaving the ground littered with corpses. The Tibetans in Sichuan, Yunnan, Gansu and Qinghai were already under nominal Chinese administration when the Communists took over in 1949. How was Tibet annexed? It was Mao’s goal from the moment he came to power. Tibet is strategically located, he said in January 1950, and we must occupy it and transform it into a people’s democracy. He started by sending troops to invade Tibet at Chamdo in October 1950, forcing the Tibetans to sign the 17-Point Agreement for the Peaceful Liberation of Tibet, which ceded Tibetan sovereignty to China. Next, the People’s Liberation Army marched into Lhasa in 1951, at the same time in disregard of the Chinese promise in the agreement to leave the Tibetan sociopolitical system intact smuggling an underground Communist Party cell into the city to build a party presence in Tibet. Meanwhile, Mao was preparing his military and awaiting the right moment to strike. Our time has come, he declared in March 1959, seizing on the demonstrations in Lhasa. After conquering the city, China dissolved the Tibetan government and under the slogan of simultaneous battle and reform imposed the full Communist program throughout Tibet, culminating in the establishment of the Tibet Autonomous Region in 1965. How did Mao prepare his military for Tibet? Mao welcomed the campaigns to suppress minority uprisings within China’s borders as practice for war in Tibet. There were new weapons for his troops to master, to say nothing of the unfamiliar challenges of battle on the Qinghai-Tibetan Plateau. The new weapons included 10 Tupolev TU-4 bombers, which Stalin gave Mao in 1953. Mao tested them in airstrikes at three Tibetan monasteries in Sichuan, starting with Jamchen Choekhor Ling, in Lithang. On March 29, 1956, while thousands of Chinese troops fought Tibetans at the monastery, two of the new planes were deployed. The Tibetans saw giant birds approach and drop some strange objects, but they had no word for airplane, or for bomb. According to Chinese records, more than 2,000 Tibetans were annihilated in the battle, including civilians who had sought refuge in the monastery. 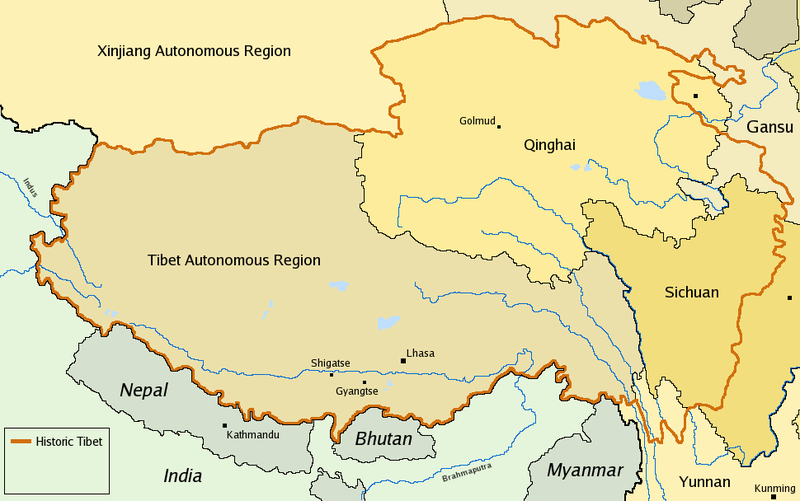 Tibet Awareness – History of Tibet’s Unrest. 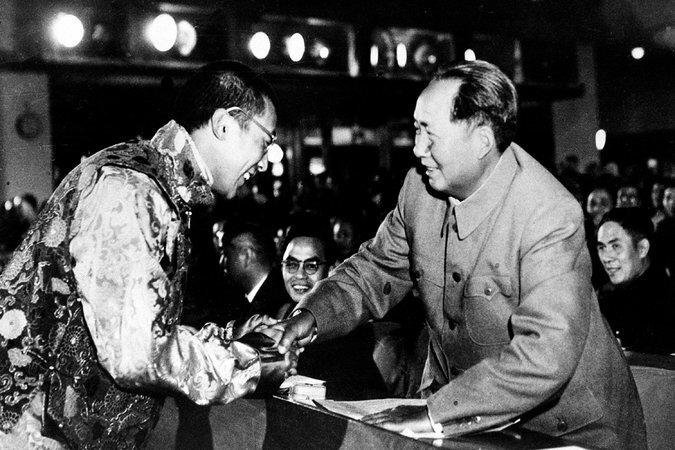 His Holiness the 14th Dalai Lama met with Chairman Mao Zedong in 1954. Tibet failed to Know its Enemy. Intelligence Disaster. Mao used his most seasoned troops in Tibet. Gen. Ding Sheng and his 54th Army, veterans of the Korean War, had gained experience suppressing minority uprisings in Qinghai and Gansu in 1958 before heading to Tibet in 1959. How often was the Chinese military used against Tibetans, and how many Tibetan casualties were there? We don’t have an exact tally of military encounters, since many went unrecorded. My best estimate based on official Chinese materials, public and classified, is about 15,000 in all Tibetan regions between 1956 and 1962. Precise casualty figures are hard to come by, but according to a classified Chinese military document I found in a Hong Kong library, more than 456,000 Tibetans were annihilated from 1956 to 1962. How does this history relate to recent Tibetan self-immolations? I think they are a direct consequence. 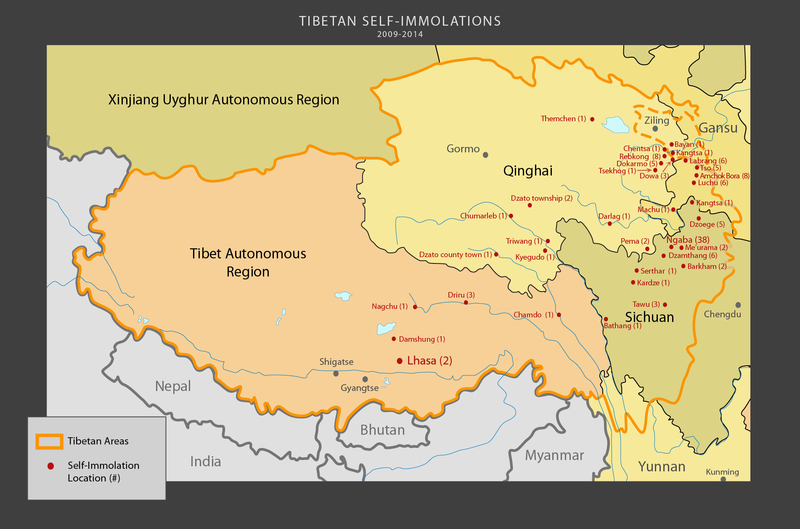 I’ve compared a map of the self-immolations with my map of Chinese crackdowns on Tibetans between 1956 and 1962, and there’s a striking correlation. Most of the self-immolations and the worst cases of historical repression are in the same spots in the Chinese provinces near Tibet. Like everyone in China, I was raised on the party line. I never thought to question it until I came to the U.S. for graduate study in 1988 and discovered how differently people here think of Tibet. Since 2007, I’ve been making annual research trips to Asia, where I have recorded interviews with hundreds of Tibetan refugees in India and Nepal, including the Dalai Lama and his brother. In 2012, I explored Tibetan historical sites in Sichuan, Qinghai, Gansu and Yunnan and interviewed people there. I crosscheck what I learn in the field with written data: official annals of the Tibetan regions, Chinese documents, and Tibetan and Chinese memoirs. How has the Chinese government responded to your work? The only official response to my books has been to ban them, but I’ve been denied a visa since my trip to sensitive Tibetan regions in 2012. This has been painful because my 84-year-old mother still lives in China. Follow Luo Siling on Twitter @luosiling. 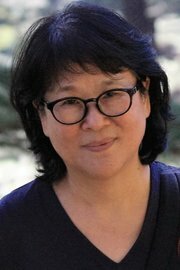 Insight, analysis and conversation about Chinese culture, media and politics. TIBET AWARENESS – HISTORY OF TIBET’S UNREST. 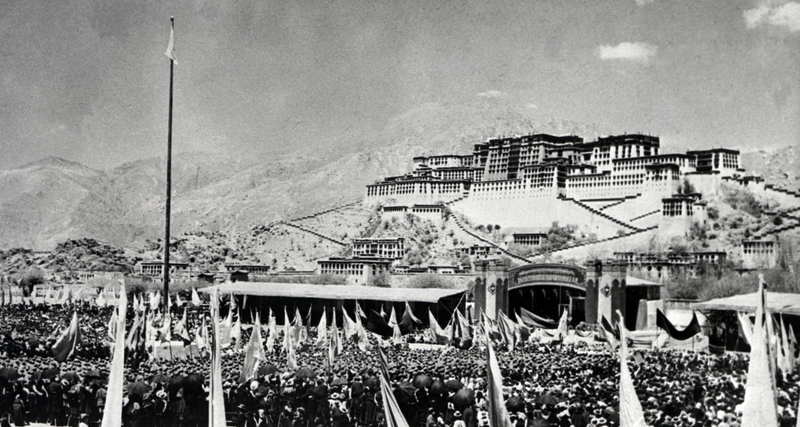 LHASA, MARCH 10, 1959. TIBET AWARENESS – HISTORY OF TIBET’S UNREST. POTALA PALACE, LHASA, TIBET. 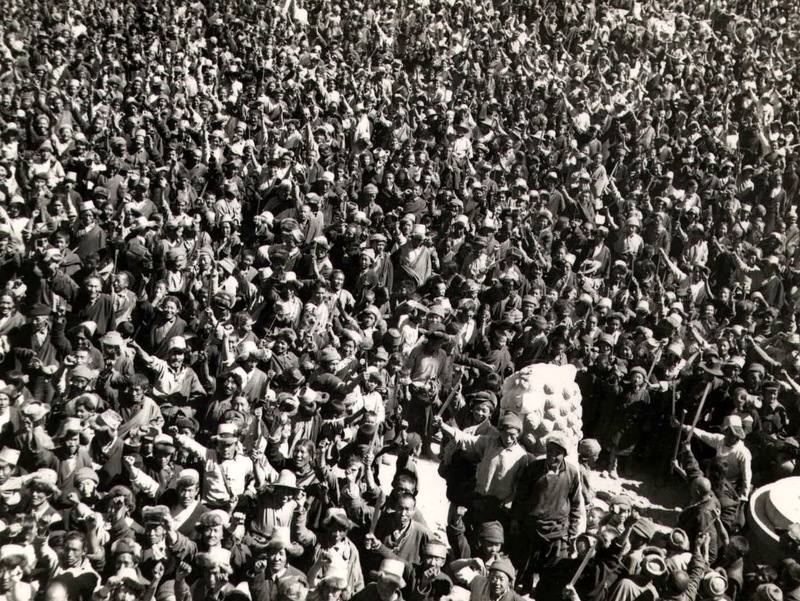 TIBET AWARENESS – HISTORY OF TIBET’S UNREST – TIBETAN NATIONAL UPRISING DAY, MARCH 10, 1959. TIBET AWARENESS – HISTORY OF TIBET’S UNREST. Tibet Awareness – History of Tibet’s Unrest. Lhasa, Potala Palace. Tibet Awareness. History of Tibet’s Unrest. 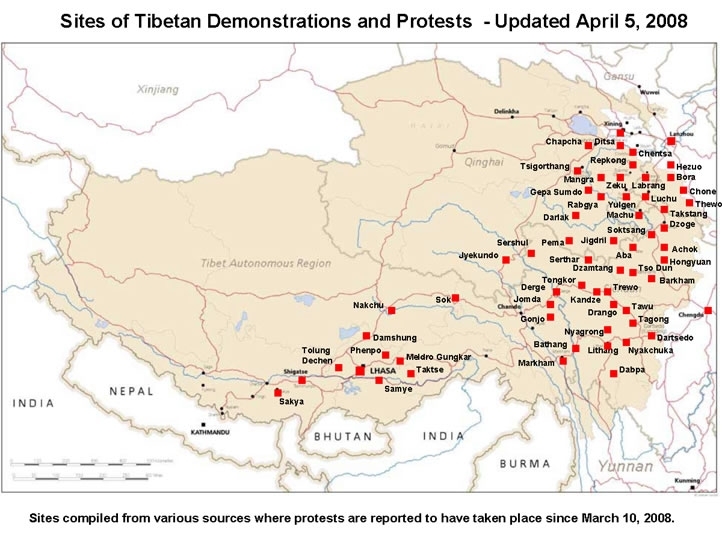 Tibet Map Self Immolations. Tibet Awareness – History of Tibet’s Unrest. Map of Peaceful Protests 2008.